We have added metal shelves into our camper’s cupboards. The shelves are modular, if you look carefully you can see they are attached to pieces of wood. I have found the fuller I pack the shelves the less things fall over, we remove one container at a time and return it to the same spot. This is going to work much better. The shelves are empty as I wanted to capture how they are fastened. Filled with most of our coffee and tea supplies. Our doors are secured with Bungee Cord Ball Loops (Typically used for stretching tarps tight on canopy frames) while traveling. They are also handy to keep the doors open, while working in the cupboards, especially if the camper isn’t level. Paper plates, paper cups, foil, lids, etc. in plastic Desktop File and magazine holders. 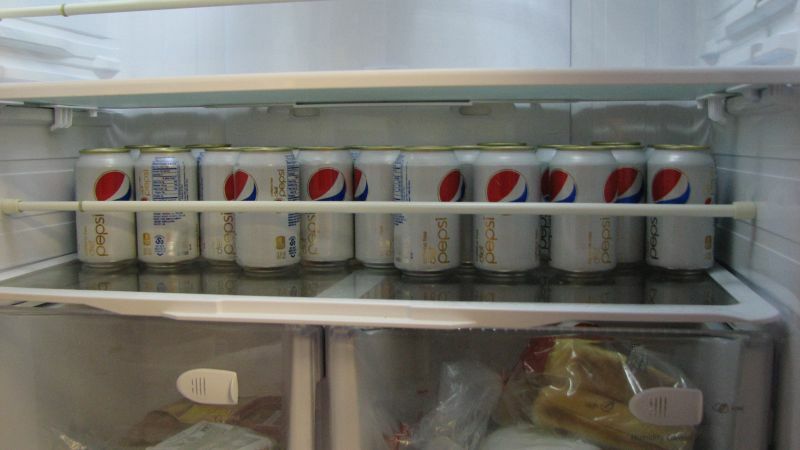 I keep canned goods in a fridge box. It was empty when I took the photo. Paper napkins, books, snacks, paper plates, paper bowls, disposable plastic containers, etc. I store paper towels, fabric wipes, paper cups, etc. in empty coffee cans. Plastic storage drawers on top of the bunk bed. We removed the mattress and replaced it with a non slip mat. When traveling the drawers are secured with bungee cords and a tension bar. I stick a tub (Sterilite White Ice Cube Bin), which is available from Wal-Mart) onto the counter with double sided Soap suckers to hold soap, detergent, hand-cream, etc. The curtain wire prevents the spices from falling out, a RV tension rod could also work. RV Tension rods keep the toiletries from falling out of the bathroom cabinet while traveling. Smaller items are in tall plastic glasses. Use a Dollar-store Cake Carrier to store paper plates, cutlery and napkins on the table to keep the bugs away, prevent then from flying away on a windy day or get dirty. Plano Drawer 1374 Tackle Box for medicine. We also have a first aid kit. A RV Tension rod in the closet prevents the hangers from falling off while traveling. Photo from Good Sam club Forum. How to make a wasp trap. We removed our shower curtain rod and attached it against the back wall to hang things like shampoo, wash cloths, etc. 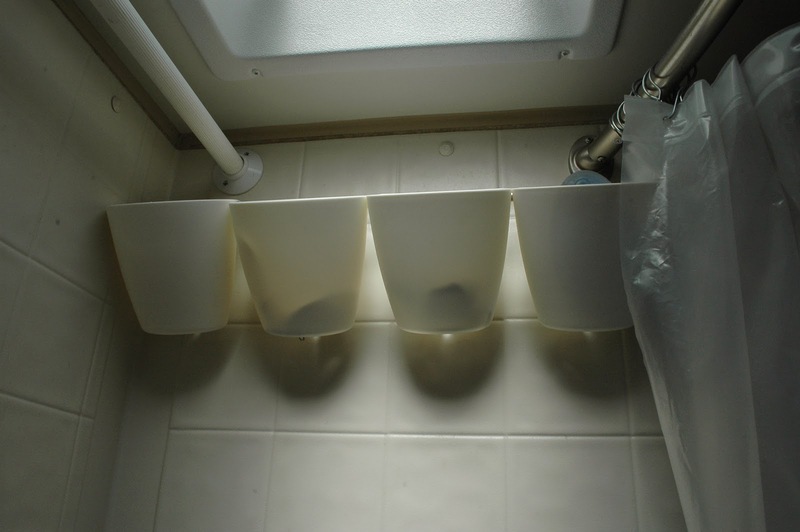 from, I use a small plastic tub in the bath, to rinse underwear and socks, which I also hang from the back rod on a Small Plastic Umbrella Shaped Clothes-horse Drying Rack Clip Hanger. We put a curving rod at the front to give more space. Mod #48: Curved Shower Curtain Rod. We have added a BYGEL Rail and Bygel containers from Ikea. We use a camouflage net for privacy in campgrounds, the campgrounds garbage cans was on the outside, while traveling it also covers the stuff in the back of our truck. We use a shade-net, which fastens onto the canopy, provides shade, helps keep the mosquitoes out, is a wind-breaker and gives privacy when we camp in campgrounds. Please click on photo for larger images. Because we boondock, we sometimes build a teepee to use a kitchen. Please click on the photo for more. Tepee in the Meadows. We bring our own fire-pit, when we boondock, which is made from a pipe culvert collar. Lodge™ Tall Boy Camp Dutch Oven Tripod, which we store in a white PVC pipe, Lodge Logic® Cast-Iron Camp Dutch Oven Lid Lifter – 15”9 (on the newspaper in the right) We use dutch ovens, even though they are heavy. 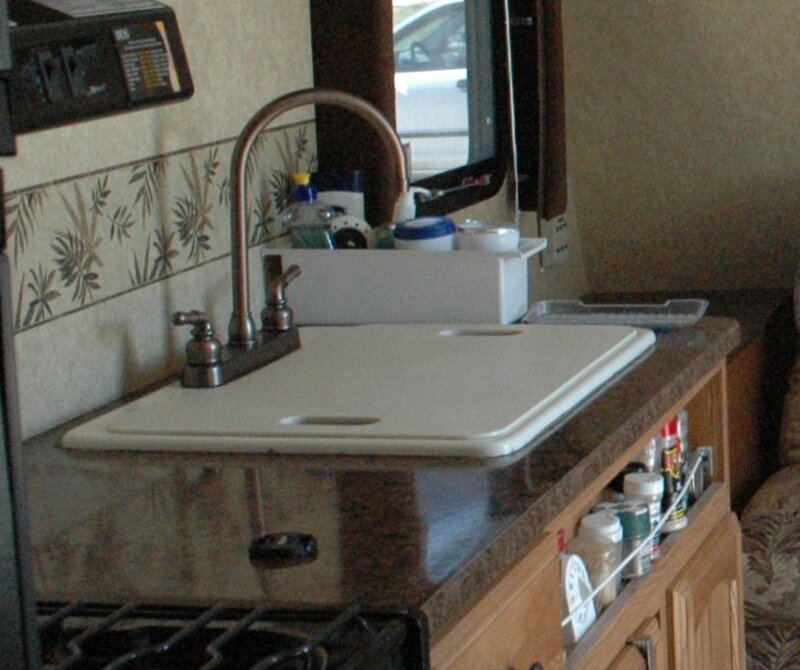 We have a larger plastic bin in which we wash them, so as not to damage the camper’s sink. Prop open fridge when in storage. Even though we have a shower in our camper, if there are ablutions, it is nice to take a long hot shower. I keep change and shower tokens in my toiletry bag for wash-rooms. It has a handle and a carabiner to hang it from door handles, shower curtain rods, etc. I wear crocks or flip-flops in the shower. Some washrooms have hand-driers which you can turn to dry up your hair. I also have a small hairdryer as some washrooms have wall plugs. We keep a wallet in the truck with change for firewood, cash for cash only campsites, Sani dumps, etc. I take the wallet with me to pay at self registration campgrounds, making a note of our site number before I leave. The wallet it also has a small calendar, on which I cross of the dates. We use micro fiber towels, face-cloths, dish cloths, etc. which washes and dries easier. Our camper’s shower-head has a shut off,so we wet and soap ourselves and only use water when necessary, especially when we boon-dock. Video here. We use a Power Tongue Jack and an impact wrench to lift the stabilizer jacks. Spend a few minutes talking to your camp hosts if you can, they have valuable information of the area and are usually very friendly and helpful. We have replaced our camper’s light-bulbs with LCD which are cooler and save power. We have a small picnic set, so that when we get invited over by other guests at a campground, we can take along our glasses, plates, utensils, etc. We use our truck to charge cellphone, cameras, etc. When it rains we cover our firewood with tarps, an old tarp is over the fire due to sparks, our other tarps are fastened to trees with bungee cords and carbines and we use boat-hooks to lift up the tarps. We lifted our camper, by turning the springs over, so we use a Single Folding Safety Aluminum RV Camper Step, which also helps to keep the camper clean. We don’t leave our tablecloth on our table, when we are not there, as we have seen abandoned campsites with crows eating breadcrumbs from tables. We mostly use paper plates, which we burn in the fire, we wipe our knife and fork clean with a paper napkin before throwing that into the fire as well. As we don’t use our oven and microwave much, we store tablecloths, oven mittens, dish cloths, etc in them. When camping in a campground we try to get a campsite away from the washrooms and garbage bins. We have a small rake which we use for broken glass, tin lids, broken tent pegs, etc. at a free campsite. We store our toilet-rolls in an Ikea plastic bag dispenser. We pack our firewood, extra propane cylinders, etc. in plastic milk crates, which makes the easier to carry and we can use them for steps when putting tarps up, for side-tables, etc. Run lines between trees at campground for the dogs. Do you have any camping hints? I would love to hear from you. There are many links here. Andy Beard uses a cereal box as a wastepaper basket in the bathroom. He has a lot of great hints. This entry was posted in Camping, Photos, Recipes and tagged Camping, hints, information, Photos. Bookmark the permalink. 5 Responses to Camper hints. Although we do not have camper, Your post was very interesting and instructive. Totally new thing to me was camouflage net! Never seen here among campers. I’m so pleased. We were so glad we had it, as it was along weekend, we could only find a campsite next to the garbage cans, which meant everyone that used the garbage cans, could see us. It lets air through as well. 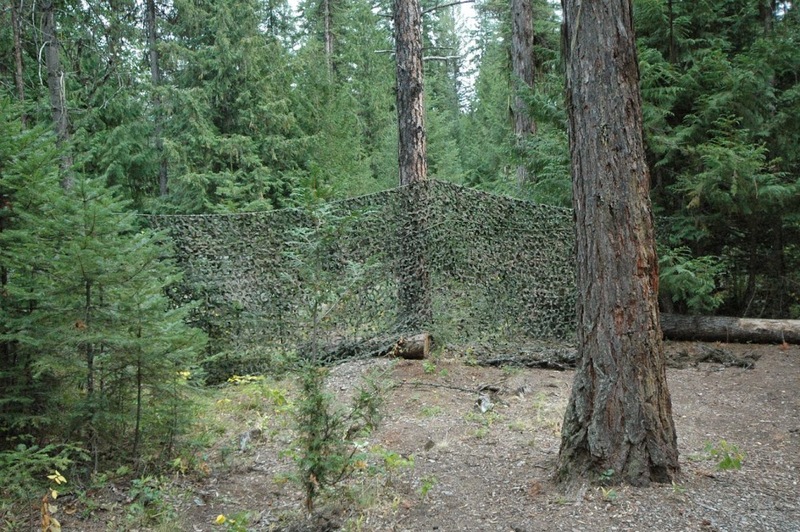 It is called a Ghillie camouflage net and we got it at an army surplus store. Some incredibly useful tips, coming from long experience. I love that interior. I’m glad you think so, I’m sure you also have some good ones. Yes, caravans have sure come along way since.